"By the early years of the 19th century it must have been increasingly apparent to François Baby that he was in need of a new house. The one he had inherited (from his mother, Suzanne Reaume Baby), had been built perhaps half a century before, and it was showing its age. His family was growing rapidly, with a new child arriving every year or two (twelve in all). But there was one more reason, possibly left unspoken: rivalry with his brother Jacques. It must have galled Francois that in 1807 Jacques acquired the splendid mansion that had been built in 1798 by the merchant Alexander Duff, at Mill and Russell Streets in the new town of Sandwich, a little downstream at the bend in the River." Determined not to be outdone by his brother, François Baby commenced construction of his new house in the spring of 1812 but work was halted in July with the start of the War of 1812. The property was commandeered for the use of an invading American army. The position of the house was crucial: not only would it allow them a convenient location to plan for an invasion of Fort Malden downriver in Amherstburg, it was strategic to Fort Lernoult directly opposite in Detroit. Several hundred soldiers pitched their tents in the orchards and gardens around the house while senior officers occupied the house. Damage sustained by the Baby house during its brief occupation (by summer's end Detroit was once again in the hands of the British) embittered Baby towards the Americans. "The Americans plundered everything I had, even what was secreted five miles back of my house�For these losses, I was but poorly recompensed." Baby managed to repair and complete his three-story house before winter. Built in the Georgian style with two rows of symmetrical windows and another row of dormer windows, the house had thick brick walls and rivaled brother's Jacques in size and elegance. After the war (and possibly before) several ferry operations sprang up, including one owned by Baby, in the landing area to provide convenient access to Detroit. By 1831, the 'name' The Ferry had appeared to distinguish this area from Sandwich. Coinciding with the arrival that year of Scottish businessman James Dougall who opened a store on Baby's wharf, the community began to grow. The road in front of Baby's house was straightened to become Sandwich Street (now Riverside Drive) and a village plot was laid out on Baby's frontage. On August 6, 1832, the first sale of an urban lot occurred. This area began to be referred to as Richmond or Richmond Landing. In 1835, another plot was subdivided by Joseph McDougall at McDougall Street and was referred to as South Detroit. The ensuing years were not kind to the Baby House ­ a fire in 1850 caused considerable damage and Baby did not have the energy to do much to restore his home. After his death in 1852, the house was passed down to his son Edmond who made several major structural changes including reducing it to two stories. Further changes by future owners significantly altered the exterior of the structure ­ the addition of bay windows and gingerbread trim transformed it into a "Victorian" dwelling. In 1930, the house was abandoned and soon became a virtual ruin. In 1933, George MacDonald, a Windsor merchant with a growing collection of local historical artifacts, wrote to Baby's great granddaughter in Detroit asking her if she would sell the house for museum purposes. Although he did not receive permission from her, when the house reverted to the City of Windsor for non-payment of taxes at the end of the decade MacDonald got his wish. But it wasn't until 1948 that restoration of the house began. The Windsor Historic Sites Association was formed that year to help facilitate the restoration and accepted title to the property for a token one dollar. 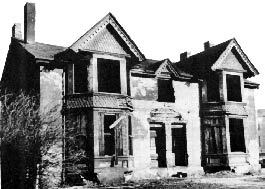 Lacking the original plans, the work was based on research of what the house may have looked like when it was built although the ten feet removed by Edmond Baby was never restored. Other donations allowed for successful completion of the project and The Hiram Walker Historical Museum opened its doors in 1958. Administered by the City of Windsor Library Board, and with the entire MacDonald Historical Collection as its nucleus, the Baby House has become an important landmark in the downtown Windsor urban landscape. Museum Curator Janet Cobban, in charge of the museum's collection for the past five years, feels that the building existence is a miracle. "It was a narrow escape," says Cobban. "The very fact that the museum was so close to being destroyed so many times, adds a great deal to its significance." While important historical buildings in Windsor are threatened or continue to be pulled down (such as the entire Norwich Block, also known as Richmond Landing), the significance of what is now known as Windsor's Community Museum, can't even be measured. Not only has a historical gem been preserved, symbolizing the very roots of Windsor, but an every growing historical collection- at last count, 14,000 three dimensional artifacts plus extensive holdings of maps, photographs, documents etc.- has a fitting "home". Two to three hundred items are added to the museum's collection each year, but most of them are small objects, photos etc. that don't take up much space (an issue in such a small building). Each year the museum mounts approximately 6 exhibits in the François Baby House plus additional offsite exhibits for special events, libraries, travel centres, etc. Keep Local History Alive! Become a Member or, donate! Membership money or other money raised by Windsor Historic Sites pays for repairs to the Baby House or is donated to the Museum for a specific exhibit or program and is separate from the Museum's operating budget. If you would like to donate to the museum or become a member, call 253-1812, e.mail wmuseum@city.windsor.on.ca or, visit the museum at 254 Pitt Street West.